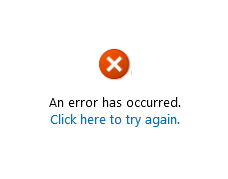 I received the following error while working with Access Databases in SharePoint 2010. “An error has occurred” with no further information. It worked after I refreshed the browser 3-5 times and failed again the 6th time. The following messages appeared in the ULS Viewer which I have seen before. The above message is related to the XSLTTransformTimeOut. The Access database should work again.